An appeal about whether it is legal to use foreign satellite equipment to show live English Premier League football in British pubs is to be heard in the High Court next year and many people's livelihoods depend on the decision. 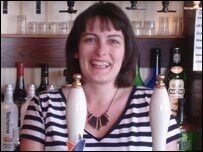 Karen Murphy runs a very English pub. It is called The Red, White and Blue, its sign features the Union Flag and it serves proper beer, pork scratchings and scampi fries. Everything about it is English - except the satellite decoder, which allows it to show live English Premier League football. That comes from a Greek broadcaster called Nova, which charges Karen about £800 a year - compared with the £6,000 a year that she would have to pay Sky for the service. She found out about the Nova box through Gales, the brewery that used to own the freehold on her pub. "At a Gales sales meeting they introduced me to this system and said 'buy it', so I bought it," Ms Murphy says, as she prepares to open her pub for the day. But the message changed when the brewery was bought out. "Fullers then took over and sent a letter saying they would advise it was removed," she adds. It is not just Fullers that holds that view. The FA Premier League (FAPL) is unhappy about it as well - and is using a company called Media Protection Services to have Ms Murphy, and several other publicans, prosecuted for breaching copyright law. The FAPL argues that BSkyB has till now had the rights to every Premier League match broadcast live - although from next season Irish sports broadcaster Setanta will also be able show a number of live games. That, the FAPL says, means that it is illegal to show live Premier League football in a UK pub unless the publican has a valid commercial agreement with BSkyB. 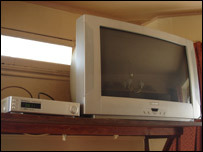 In Karen Murphy's case, the FAPL won in the magistrates' court and the crown court and the case is now the subject of a High Court appeal which will decide whether the use of foreign decoders is illegal. Derek Hopper is worried he might lose his licence if he gets a criminal record. There are many people with a lot at stake in Ms Murphy's court case, and she accepts that she may be a pawn stuck in the middle of a dispute between larger companies. "I was quite happy to be used because I wouldn't be doing it if I didn't believe what I was doing," she says. "I don't want to be dictated to by a monopoly, it's as simple as that." An FAPL spokesman agreed that people like Ms Murphy were in an awkward position, but blamed the satellite installers. "I feel sorry for the publicans because they are being used by a group of people who are providing an illegal and misleading service, but ultimately it's the publicans who stand to lose the most," he said. However, the FAPL refuses to sell live rights to games shown at 3pm on a Saturday afternoon to anyone in the UK - not even BSkyB. And this, according to the installers, creates a legal let-out clause. It comes as little surprise that their trade body, the Association of European Satellite System Installers (AESSI), is backing the publicans who are being prosecuted. Joe Ibrahim, an AESSI member who runs Digital Sales UK, obviously has a great deal at stake too if Ms Murphy loses her appeal. "We would have to close or try to find some sort of alternative business to do," he says. "It seems wrong that we should have to do that when as far as we're concerned we haven't broken any law." Ms Murphy is not the only publican being taken to court for this. In fact, she is not even the only one on her street. About five doors down from The Red White and Blue is the Royal Exchange, which is run by Derek Hopper. The Royal Exchange is also a very English pub - it has a quiz night and a weekly meat raffle. But its satellite decoder comes from a Moroccan broadcaster called ART. Publicans such as Mr Hopper and Ms Murphy say they are risking everything to pursue these cases. "Under the terms of our licensing law, anyone with a criminal record can be deemed by the council as not a fit and proper person and that license can be revoked," he says. "And it's not just losing your livelihood, it's your house." Ms Murphy says that she and Mr Hopper are not the only ones using foreign systems in the area. "There's hundreds of pubs in Portsmouth that do not use Sky and they've only attempted to prosecute five of us," she says. "Within walking distance from here there's another 20. They all use it for a reason - they obviously can't afford Sky." The FAPL, for its part, is in no doubt about which law is being broken. Its cases are being prosecuted under the Copyright, Designs and Patents Act 1988, which centres on whether the publican "dishonestly receives a programme provided from a place in the UK, with intent to avoid payment of any charge applicable to the reception of the programme". The installers say that their clients are not avoiding making a payment because they are paying the European broadcasters - and in any case, have no charge to avoid since there is no UK broadcaster providing games live at 3pm on a Saturday. The case is likely to feature numerous experts, arguing a huge range of issues which might more usually appear in a civil case - not least that of whether the signals have actually been "provided from a place in the UK". The FAPL has now started pursuing civil cases against two of the installers and some publicans. However, success in the criminal courts could serve as a deterrent to other publicans using foreign systems. The FAPL has an enormous amount at stake in this case, because if it loses then Sky could lose its exclusive live broadcasting rights to certain matches. If Sky were to lose those rights, it might then try to recoup some of the £1.2bn it is paying for them - and that would be bad news for the Premier League clubs now basing next year's budgets on a massive TV rights windfall. It could be that the fate of a Portsmouth publican could decide the fortunes of football's biggest names.